Breaded with Italian seasonings, then baked. Very tender & juicy. Bread included. Seashell shaped pasta stuffed with ricotta & mozzarella cheeses, topped with our homemade sauce. Long Pasta stuffed with ricotta cheese. Layers & layers of scrumptious lasagna sheets, meat, ricotta & mozzarella cheese. Bread Included. 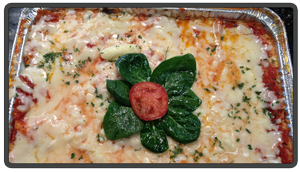 Layers of delicious ziti with mozzarella cheese, no meat. Bread Included. Fresh Broccoli with delicious ziti. Topped with garlic & extra virgin olive oil. My sister in law's delicious lasagna made with marinated spinach, roasted eggplant, roasted zucchini, peas, layered with ricotta and mozzarella cheese. Bread Included. 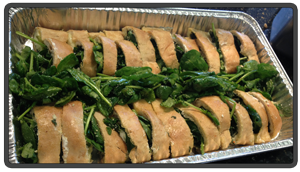 Layers of our marinated spinach with lots of mozzarella & ricotta cheese. Bread Included. Joey's mom's old family recipe! Each meatball is made with loving care & the Italian sausage is tender & juicy. Not too hot or spicy - Just Right! Bread Included. A Delicious dish... Lightly floured chicken breast. Drenched in wine & mushrooms. Bread and Spaghetti included. Great Side dish. Made with our delicious Italian sausage, mixed peppers & onions. Bread Included. Three layers of delicately breaded chicken breast with lots of mozzarella cheese. Bread Included. Can be eaten hot or cold. Bread Included. A Perfect Finger Food for any event! Delicious and will be a home run at any party! Each Log makes about 20-22 pieces served with sauce for dipping. Made with extra virgin olive oil, and seasoned with oregano. Very Good! Served cold as a side item. Made with fresh garlic, topped with vinegar. Excellent appetizer! Served in tray as a side item in sauce. Made with only the freshest ingredients. Romaine mince (no Iceberg), fresh roma tomatoes, cucumbers, black & green olives, red onions, pepperoncini peppers. Topped with our delicious dressing. Made with our marinated vegetables & romaine lettuce topped off with delicious provolone cheese, genoa salami & ham. This word means "Lift Me Up" and it's combination of creamy espresso liquor and lady finger cookies will do just that... Fabulous! All orders are served in aluminum trays. additional charge for service in formal chafing trays. Also available to enhance your occasion: balloons, centerpieces, party favors, Invitations, etc. all prices are subject to change. All prices include tax. All pasta dishes include our homemade bread. Custom orders are available upon request. Call for details.